Care is a word that, over time, has become toxic in the Irish psyche. It has gained the quality of an auto-antonym, now more associated with endemic, institutional abuse than with nurturing and protection. From the expansion of industrial schools in the 1920s to their winding down in the 1970s, Irish children were subjected to a hellish existence at the hands of a morally bankrupt Church acting with impunity. Seen as the answer to the problem of childcare by the Department of Education in their inception, the schools represented the State shrugging off responsibility for children in need of care. The publishing of the Ryan Report, the Roscommon Child Care Case Inquiry and the Child Death Review represented a turning point for Irish people; the reports’ harrowing revelations have been reported as the cause of falling church attendance, increased atheism and deeper distrust of institutions. None of this is surprising. 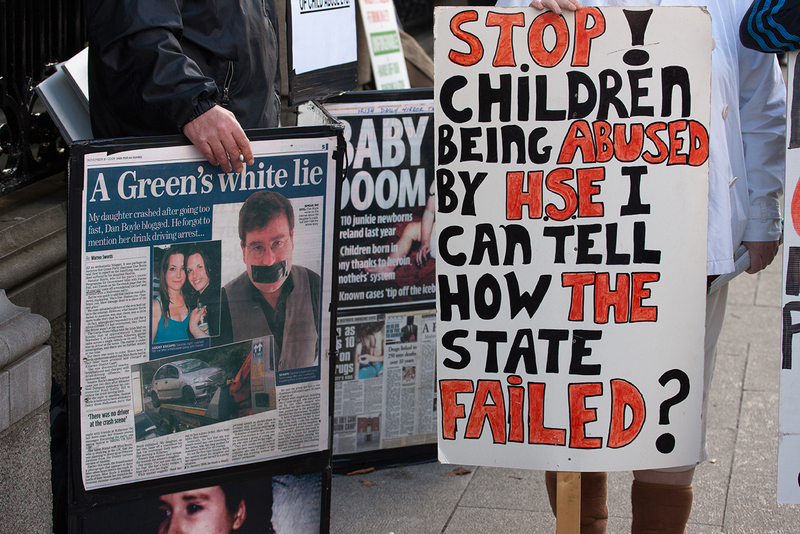 However, the most important mandate brought about by these inquiries is a complete overhaul in child protection services in Ireland. Of this, we have a much less clear picture. In the aftermath of these reports, the government made a commitment to uphold their statutory requirement to protect children and develop a quality service. In order to assess their progress and to get a greater image of the state of care in Ireland, I met with Jennifer Gargan, the director of Empowering People In Care. EPIC is an advocacy group with a mission to amplify the voices of people in care and with care experience. She says the last eight years have seen huge positive changes and a shift in attitude. The 2012 referendum prioritising children’s rights and underlining a constitutional obligation for the state to uphold them was a big part of this. The high standards set by the Health Information and Quality Authority (HIQA) and their transparent inspection and reporting processes are a welcome monitor on the pulse of Irish childcare. Progress has been made in developing this system. What of the state of childcare today? Jennifer hit me with the startling figure that 40,000 children are referred to the HSE every year by those concerned for their well-being. Once a child is referred, their situation is reviewed and every effort is taken to support the family and keep the child in their home situation with their primary caregivers. However, in a number of cases the home situation is simply not safe for the child and they must be taken into State care. Although some children are subjected to direct forms of abuse at home, the majority suffer from neglect, which Jennifer describes as “a very insidious form of emotional abuse”. A lack of attention and nurturing harms their senses of identity and self-esteem. They suffer in school for their poor hygiene and dirty clothes. They are quite simply better off escaping from a world of neglect. These cases enter into the State care system and constitute between 2,000 and 2,500 of referrals. There are currently over 6,400 children in the care system. 5,800 are in foster homes, about one third of these being the homes of relatives. Potential foster parents go through stringent vetting and training before being allowed to take on a child. Although not much is revealed by the HSE about the success of foster care, EPIC are informed anecdotally that fostering yields better outcomes than institutional care. Jennifer tells me of children who grow up with their foster family as a secure base, returning at holidays and remaining in close contact. The vast majority of people do well in care and go on to succeed in education and lead happy lives. Success stories are seldom reported in the media and the world of childcare is no exception. It is the 450-500 children in residential or “other” care (the HSE do not provide clearer breakdowns than this) that we hear most about. Most recently, the HIQA report into the Crannóg Nua High Support Unit found inadequate management of high-risk behaviour, which was most notably displayed in the locking up of children from 8am to 8pm every day. Secure care, i.e. locking up, is only permitted by a High Court Order when no other alternative is available. In this case, and in a similar case in Rath na nÓg High Support Unit reported in October 2013, it is clear the institutions overstepped their mandate. These reports are worrying, echoing the interpretation of “care” as “control” we saw in the last century. I brought up this philosophy of controlling rather than caring with Jennifer. I had come to believe, rather cynically, that social workers saw children as a commodity to be dealt with in their line of work, rather than as young human beings. However, she informs me that social workers have the very best of intentions. The issue here is a system under strain – 542 of the children in care have little or no interaction with their social workers. With many social workers juggling up to 52 cases at once, it is easy to see how one person may not simply have the time to pay each child the attention they deserve. It is understandable how 20% of cases take up 80% of the time as children act out to gain attention. This is no fault of the children; their frustration is no surprise when requests to meet siblings and to see their family at Christmas are not responded to. Another issue Jennifer raises regarding this undesirable philosophy is that reform on the legislative and policy level has not yet trickled down to ground level. Embracing high standards and children’s rights at a governmental level does not mean instant change in the attitude taken by those operating in residential institutions. This she identifies as a problem that must still be dealt with. Hopefully, frequent inspection by HIQA will not only encourage but enforce this change in attitude. Reviewing EPIC’s press statements online, it is striking how often they release a comment on HIQA reports, noticeably more often than the media does. This is mainly because many of their reports into residential care have overwhelmingly positive points to make, points welcomed by EPIC. This gives evidence of a system that is changing for the better, even at the level of residential institutions. Overall, Jennifer’s message was heartening with an optimistic take on institutional reform, coupled with the success stories of the fostering facet of care. However, there is still a great deal to be done. I asked her where she hoped to see strides made in 2014. She identified two key areas: earlier intervention and aftercare. Underfunding and understaffing make life difficult for the child protection services, the best solution to this is to lower the amount of children entering the care system through early intervention. The first way to bring this about is through education. Although parents guilty of neglect are often suffering from mental health and substance dependency problems, one of the biggest issues is that they do not know how to look after children due to lack of experience and education. By educating secondary school students on a general level and by directing more specific education to inexperienced, young parents, this can be tackled. Early intervention also includes the identification of neglected children early on. This prevents their situation from deteriorating and stops further harm to the child, as well as making them less difficult, expensive and time-consuming to deal with. Early intervention is the cornerstone in an efficient and effective childcare service. Aftercare is on the latter end of a child’s experience with the child protection services. Jennifer laments the lack of a statutory right to aftercare, leaving emerging adults without a secure base. When faced with adversity, people need someone to turn to and in the case of those in care, who have no parents to do so, a service needs to be in place. Furthermore, this service cannot be a sticking plaster on a weak system. It must be built up on the foundation of a reliable and effective care system. Ultimately, we are in a situation where much work has to be done, particularly in managing youths in High Support Units more constructively and holistically. However, the fact that the public are privy to HIQA’s inspections of childcare services – that we know of situations where services do not meet standards – is very positive indeed. It means that unlike when under the auspices of the Catholic Church, our child protection services are regularly scrutinized and questioned. This self-reflective nature can only improve the quality of services and foster a positive attitude towards childcare both within the service and without. Phone: (01) 872 7661 Mobile: 087 903 6598 (for text messages).